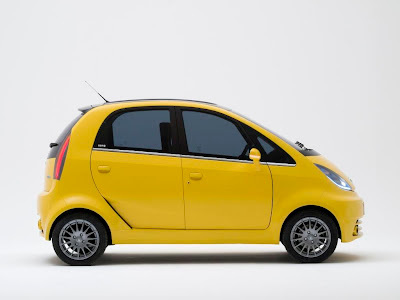 The cheapest car in the world known as TATA NANO is now converted into a mid sized hatchback (TATA NANO TURBO). It is more bigger than the original nano. It is equipped with Turbo charged Engine which is more powerful. It is just an concept form of future TATA nano which is limited only inside a picture. The above picture is of TATA NANO. The modified version of above car is below. The bonnet hood is extended to fit a turbo charged engine. It has Tyre with rear and front disc brakes and unique rims. Some body structures are changed like in front part rear part and the door side. It has all-round body protecting black side skirts and rear and front bumpers. This is the result..